A woman who spent five years studying in a nunnery and once dreamt of becoming a nun has been crowned Miss World 2011. Miss Venezuela, Ivian Lunasol Sarcos Colmenares, beat contestants from 113 countries to the coveted title after impressing the judges in the categories of beach beauty, top model, talent, sports, and beauty with a purpose - where the contestants must demonstrate involvement in a charity project. Ms Sarcos Colmenares, 21, was orphaned at a young age and spent five years studying at a nunnery. She dreamt of becoming a nun but her life took a different direction, as she gained a degree in human resources and worked for a broadcasting company before becoming a beauty queen. She was the favourite for the Miss World title going into the final at Earls Court, London, yesterday evening but reacted with delight and disbelief when she was announced as the winner of the famous beauty pageant. Now she said she wants to use her title to help other people. She said: 'Winning means everything to me and I hope to take advantage of being a winner in a productive manner. I’m unbelievably happy to have won and there are some incredible girls. I first and foremost want to help people in need. I would like to help people like me. I am an orphan. I would also like to help the elderly and troubled teenagers. As many people as I can. Billions from around the world tuned into see her crowned the winner while the runners up prizes went to Miss Philippines and Miss Puerto Rico. Fans who were unable to follow the final on television were kept up-to-date on the internet via live streaming and Facebook updates and tweets. Representing the UK, Miss England, Alize Moutler, and Miss Scotland, Jennifer Reogh, both made it into the top seven. But Miss Wales, Sara Manchipp, and Miss Northern Ireland, Finola Guinnane, did not make it to the semi-final. This was the 60th year of the beauty pageant and to celebrate its diamond anniversary, it returned to the city where it all began. The first was held in London in 1951 during the Festival of Britain on the South Bank of the River Thames. But throughout its 60 year history, the beauty competition has attracted critics as well as fans. This year was no different and campaign groups, including London Feminist Network, Object and UK Feminista, voiced their opposition to the 'sexist contest'. 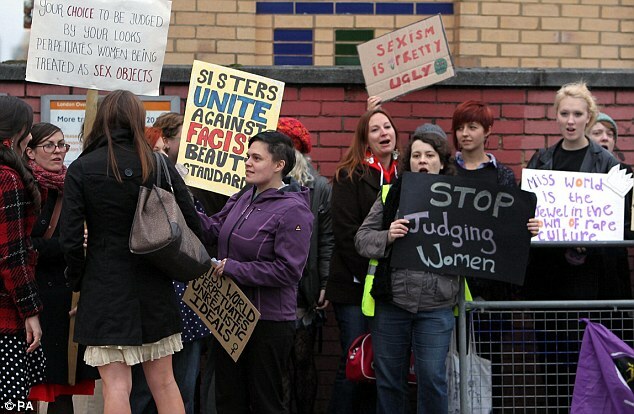 A statement on the London Feminist Network website rallied women to join a protest they held at Earls Court while the competition was taking place. A statement on their website said: 'Let the organisers and all those profiting from the event know that we are all angry that such an event is once again being held here in London. But Miss England director Angie Beasley disagreed with their sentiments and said the contest 'had changed with the times' because it was no longer just about looking good in swimwear. She said: 'There is a talent, sports and Beauty With A Purpose round, which is the fundraising round, in the contest and the girls love taking part. 'Yes they have to look great to win but it's so much more than a beauty contest. These people should give it a chance instead of thinking it's just a bikini parade. 'I'm all for women standing up for what they believe in which is why I run Miss England but I'm fed up of these protesters trying to bully us and push us around. The message that the competition is now about brains as well as beauty was shown by figures that revealed out of this year's contestants, more than half are studying for a degree, one in four are graduates and more than half speak at least three languages. The contest was also revealed to have the support of Nelson Mandela. He sent a message which was read out during the final sending his greetings to all the contestants and congratulating them on their efforts for charities. TV presenter Bruce Forsyth also took to the stage with his wife, Wilnelia Merced, who was crowned Miss World in 1975, while dance group Diversity and boyband Blue performed for the worldwide audience. In her new role, Miss Venezuela will now spend the year visiting and supporting a range of global charity projects supported by Miss World's Beauty With A Purpose programme.